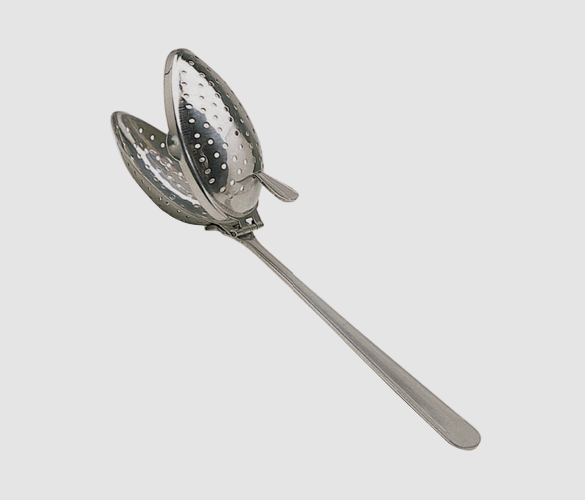 A tea infuser perforated spoon is an easy way of brewing loose leaf tea. This spoon has a simple and elegant design with a long handle and perforated head. Brewing with an infusing spoon is as simple as pour, stir, sip! This would be the perfect gift for the tea lover in your life. If you’d like to pair it with a premium tea but don’t know which to choose, take a look at our guide to choosing the best loose leaf tea. Fill the spoon with loose leaf tea, it is best to use one scoop per cup. Boil fresh water in the kettle and then allow to cool for a couple of minutes. Don’t use boiling water as this may damage the leaves and give a bitter taste. Make sure the spoon is properly closed and place into your cup. Pour the hot water in and fill your cup. Allow to brew (the time will depend on what type of tea you’re using). If you want to speed up the process a little, stir the spoon around the cup. When it has reached your desired strength, simply take out the spoon and enjoy! It is best to immediately remove the loose leaves from the spoon after brewing. This makes cleaning much easier and will stop any residue from building up. We recommend thoroughly cleaning the spoon after every use to maintain hygiene and so the product will last through many uses. Tea infuser vs tea strainer – which should I use? Infusers and strainers are both popular methods of brewing loose leaf tea. Infusers can be spoons, balls, rods or any other shape that can hold loose leaves. There is usually a chain or handle on an infuser, so it can be easily retrieved from the hot water. A strainer is a device that sits on the rim of a cup of teapot. This differs from an infuser which is usually fully immersed in the hot water. A strainer usually looks like a little sieve that is partially dunked into the water. The loose leaves sit in the sieve so that brewing can take place. There is not much difference between these two methods and there is usually no detectable difference in taste. It is really down to personal preference as to which you choose. Some favour infusers as the leaves have more room to expand, where as in a sieve they are pressed against the metal mesh by the water.